I. Introduction: There are several species of fruitworms affecting apple; the green fruitworm, L. antennata, speckled green fruitworm (O. hibisci) and humped green fruitworm (A. pyramidoides) are among the more important. The speckled green fruitworm is the most common. II. Hosts: A wide host range, including apple, cherry, plum, pear, apricot, strawberry, quince, willow, birch, poplar, balsam, alder, choke cherry, and maple. When densities peak generally, populations overflow into orchards. III. 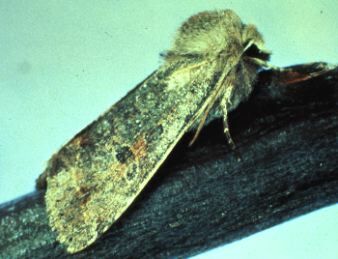 Description: Adults of most species are brownish moths with a wing spread of ca. 1.5 inch (40 mm) (Plate 29). 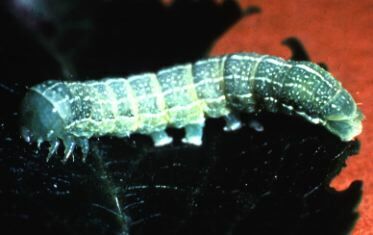 Larvae of the speckled green fruitworm are light green, while the humped green fruitworm is darker green; both possess a pair of lateral white stripes, with additional white spots (Plate 30). Additionally, the humped species has a dorsal hump at the rear of the body. Mature larvae are ca. 1.5 inch (40 mm) long. Pupae resemble those of leafrollers, but are larger, reaching lengths of about 3/4 inch (20 mm). IV. Biology: Fruitworm species have one generation per year. Speckled green fruitworm overwinters as pupae in the soil, adults emerging in the early spring and invading orchards and ovipositing at the onset of tissue growth. Eggs are laid beginning at the half-inch-green stage. Humped green fruitworm overwinters as an egg. These eggs hatch with other fruitworm species' eggs. Larvae feed on leaves, buds and developing fruit; each larva may injure several fruit. When larvae are mature, they enter the soil to pupate. Adults emerge in mid-summer, fall, or the following spring, according to species. V. Injury: Foliar injury is usually not important; economic damage results from larvae feeding on young fruit. 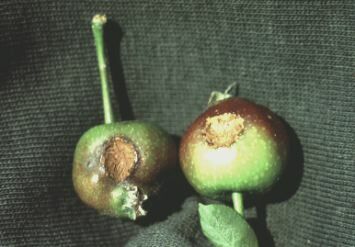 Damaged fruit may drop early; or fruit may remain at harvest with deeply sunken areas (Plate 31). Symmetrical deep round holes are often seen resulting from green fruitworm feeding. Injury may be confused with that caused by early redbanded leafroller feeding, but is usually deeper. VI. Monitoring: Examine 10 fruit per tree from each tree scouted from pink through early summer. Beating trays have also been used to search for larvae. A commercial pheromone is available for speckled green fruitworm (O. hibisci) that is very effective. A provisional threshold of 1 larva or feeding scar per tree has been used in Massachusetts.